If you’ve lost weight eating nothing but lettuce and fat-free chips, this may come as a shock but the best weight-loss plan is also the one that’s most nutritious. Most people think of weight management and healthy eating as two separate things. But when you’re managing calories, it’s more important than ever to have a good balance of foods. Fruits and vegetables, lean sources of protein, low-fat dairy and whole-grain, high-fibre foods are the elements of good nutrition and have also shown to help with satiety. You don’t have to reinvent nutrition when you’re trying to manage your weight. If you want to cut something out, start with the obvious – empty calories. Cut out sugar and soda if you had to get rid of two foods that would sabotage any diet in the stratosphere. People eat a consistent weight or volume of food each day. So you can eat the same amount of food and get fewer calories by choosing foods that are less energy-dense. Which foods fill you up and provide you with nutrition without a lot of calories? Fruits and vegetables, which are both rich in fibre and high in water content. Fat packs 9 calories a gram, water packs none. When fruits and vegetables constitute the bulk of your plate (and I don’t mean French fries), you’ll lose weight and keep it off. It’s virtually impossible to get fat eating fruits and vegetables, there are less than 100 calories in a vat of spinach! Lean protein (fish, white-meat chicken and lean cuts of pork and red meat) will also help manage hunger. And, it’s important to reduce fat, but not too much, since fats help you absorb vitamins. A drizzle of olive oil, a “good fat”, is okay. 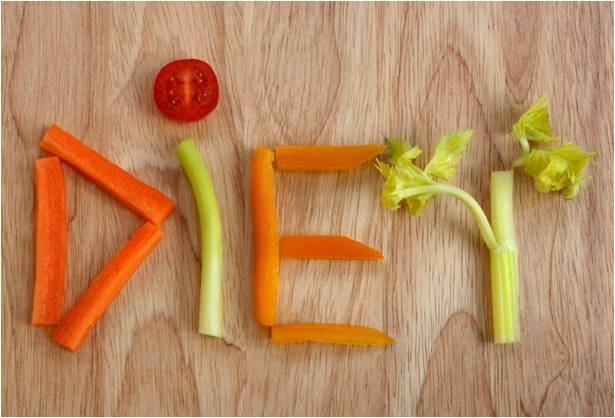 You can lose weight on any fad diet quickly. The problem is that the human body hasn’t evolved beyond its feast-or-famine origins: When you crash diet, the body thinks it has to store fat to survive this time of famine. The answer is a slow and steady weight loss of no more than 1kg per week, which doesn’t send up the internal red flags that cause our metabolism to slow down. You can also apply this concept to the pacing of your meals. First, don’t skip any. Dieters who ate breakfast reported working out more, making them more successful at shedding weight. So get into the routine of eating breakfast, lunch and dinner and two healthy snacks each and every day. Second, don’t rush. It takes about 20 minutes for your body to register that you’ve had enough, so if you eat quickly, it’s easy to eat too much. – Buy small (25ml) plates to use at home. – Drink out of tall, thin glasses. – Split restaurant portions with a friend or ask for half of your portion to be wrapped up in a doggie bag before it’s even brought to the table (and save it for lunch the next day). -To avoid overeating when dining out at a restaurant, order a salad with light dressing on the side, both-based soup or light appetizer and wait until you’ve eaten that to decide whether you want to order more.